Preheat oven to 325°F. Into a large Ziploc bag, pour the powdered cheese, garlic powder, onion powder, and cayenne pepper. Set aside. Brown beef and drain excess fat. Take the taco seasoning mix from the packet and add it and 2/3 cup water. Cook for a couple of minutes or until thickened. When beef is almost done, spray taco shells with cooking spray. Place 2 taco shells at a time in the Ziploc bag with seasonings and shake gently to coat with the powder. Repeat until all shells have been coated. Place shells on a cookie sheet and bake for 3-5 minutes or until golden and crispy. Remove shells from the oven and fill with seasoned taco meat and desired toppings. * Note: Instead of the powdered cheddar cheese topping called for in the ingredients, you can substitute the powdered cheese that comes with boxed macaroni and cheese. You’ve had ‘em at taco places – and now you can make ‘em at home. Crazy cool tacos in nacho-cheese flavored shells that'll have you livin' los tacos locos! It was taco night at our house and I was craving one of those nacho flavored taco shelled tacos from that crazy fast food joint. But I didn't want to leave the house because it was Monday, which is family night around here, and I had to get dinner started pronto. So I started experimenting, trying to come up with that nacho cheese flavor in powder form so that I could coat my own taco shells in the delicious flavor. I had a bag of nacho flavored chips for comparison testing. Let me tell you, it was hard, hard work. I tried reading the ingredients on the back of the bag of chips for some direction but had to Google every single obscure ingredient. Not what I was looking for at all. It was time to get creative. I had some boxed mac n' cheese in my pantry and stole the powdered cheese from the box. Turns out they actually sell this cheese powder at my grocery store. I found it both by the grated Parmesan cheese and also in the popcorn aisle. I started adding some garlic powder, onion powder, and cayenne pepper for a little kick. Perfecto! From there, dinner was a snap using an Old El Paso Taco Dinner Kit. I had my kids in the action -- shaking the powder on the taco shells and dancing around the kitchen. Start with an Old El Paso Taco Dinner Kit. It comes with taco shells, taco seasoning, and taco sauce - a no brainer. Here's the magical powder that transforms normal taco shells into Taco Loco nacho cheesiness. Spray it with cooking spray so that the powder has something to stick to. Place the powder in a large resealable bag along with two taco shells at a time. Let your kids shake it all around (gently) to coat the shells. Bake the shells for a couple of minutes to get them nice and golden brown. Baking them also sets the powder on the shell. 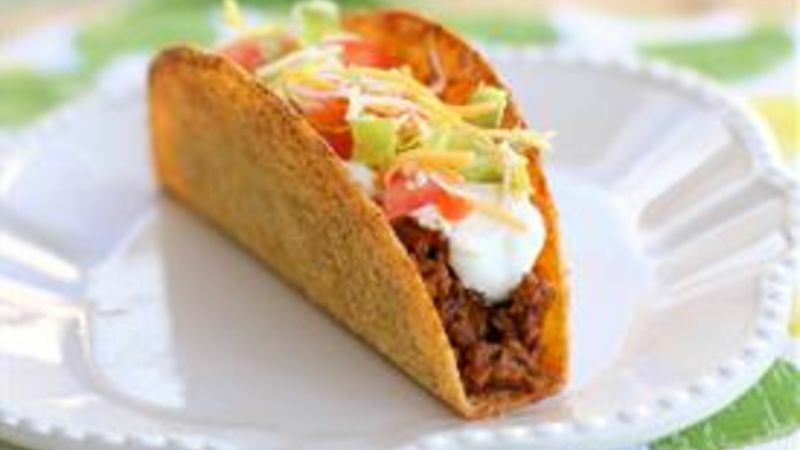 Fill the shells with seasoned taco meat and your favorite taco fillings. There they are -- taco delish! Woo-hoo! Do you have the Tacos Locos fever yet? Make these for your next family taco night for a night full of flavor and a little crazy fun! If you like tacos, mix it up with these recipes that take your fave flave into new forms!